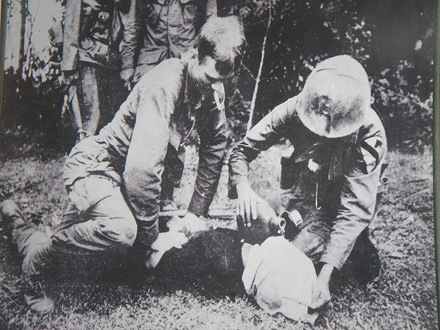 The torture of Pedro Albizu Campos while in La Princesa was part of a wider pattern of US interrogation techniques throughout Latin America. There were even two manuals for this SOP of torture: the KUBARK Counterintelligence Interrogation (US Govt. Printing Office, 1963) and the Human Resource Exploitation Manual (US Govt. Printing Office, 1983). There are chapters on debility, dread, fear, intense fear, pain, intense pain, sensory deprivation, anxiety, threats, hypnosis, narcosis, and torture. In addition to these two CIA manuals, seven additional Spanish-language manuals were used for decades in Latin America. These manuals were even more explicit than the first two: with detailed instructions on the use of beatings, false imprisonment, extortion, truth serums, and executions. The Spanish manuals were distributed to thousands of military officers throughout Latin America, and used as lesson plans in the “School of the Americas” in Fort Benning, Georgia. When a few Spanish manuals fell into the “wrong” hands (ie, the general public) the US Dept. of Defense tried to burn all the copies, and claim that they never existed. The way of the “Master” hasn’t changed with time; don’t expect it to!! Standard procedure? No wonder why Puerto Rico got taken down!